What are Stop Loss and Stop Limit Orders? Stop Loss and Stop Limit Orders are directives whereby an investor instructs a broker to automatically trade a particular stock if its price drops to a certain level. A stop loss order, which is also called a stop order or a stop market order, is a directive whereby an investor instructs a broker to automatically trade a particular stock if its price drops to a certain level. A stop loss order is perceived as a risk mitigation strategy in stock trading. It is an advanced type of trade order usually applied with many brokerage houses. With the different things to look at when weighting a stock buy, it might be easy to forget some of the nitty-gritty strategies that can help you protect yourself from losses or maximize your profits. A stop loss order may be one of those many facets that you should not forget to apply in your risk management strategy. A stop loss order will be placed with a broker to either buy or sell a stock once the price reaches a certain level. It will limit an investor’s losses on a particular position. For instance, when you set a stop loss order for about 10 percent below the price you bought the stock; it is going to limit the loss to 10 percent. Let’s say you purchased Microsoft (Nasdaq:MSFT) at $22 per share. After buying, you enter a stop loss order of the stock for $20. It means that should the stock fall below $20, the shares will be sold at prevailing market price. The order specifies that you, as an investor or trader, want to execute a trade for that stock only if a specific price level is attained during trading. A stop loss order may be different from the typical market order in which an investor simply specifies they want to trade a certain number of shares of the stock at current market-clearing price. Therefore, a stop limit order is an automatic trading order that an investor gives to their brokerage. 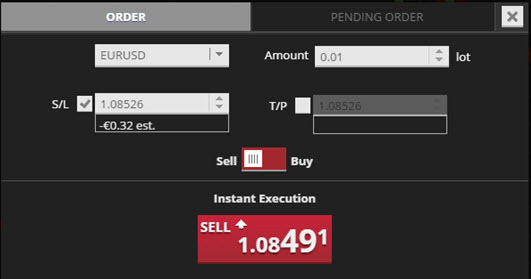 The order only becomes active and executable once the stock price in question falls to the specified price as depicted in the investor’s stop loss order request. When you buy shares of a stock at $20 and currently they are trading at $30 each share, and you want to hold your stock to take advantage of future price appreciation, you may set a stop order at about $25 to protect yourself from unprecedented loss. The reason why stop orders are important for an investor is because the prices of stocks can change unexpectedly and at times, you may not be around to initiate the trades manually. Meaning, if you have not set a specific stop order price, you may continue to suffer losses and your capital could be wiped out entirely. While you want to realize a gain in a position, on the other hand, you also want to protect yourself from losing all of the unrealized gains that have already built up from the time you bought the stock. You would therefore want to ensure that you could sell out the position if the shares of the stock fell to $25. You don’t need to watch the market every day so that you sell the shares should the price fall; the stop limit sell order you have set with your broker will take care of that should there be a shift on the price to the south, which could result in loss of your unrealized gain. Unrealized gain is a profit that only exists on paper from an investment. When you have executed a position and it is profitable but you have not yet cashed in on that profit, such a winning stock position will only remain open and only becomes realized after you have closed the position for a profit. The same applies with unrealized loss where the stock drops in value after you open a position. Stop loss orders are often regarded as a short-term stock trading strategy. These orders are useful because they allow you to reduce the need of having to monitor your trade every day or every hour. The trade is by large set on autopilot. This strategy is particularly helpful to traders who are considered emotional investors. While stop loss orders may offer you vital trading discipline by ensuring that you cut down losses should the stock price go the opposite direction, on the flip side, it may also increase the risk of exiting a position too early. This is particularly true where volatility is witnessed in stocks. For example, if your stock price fluctuated from $20 to $50 during one-month period, you are likely to miss out that price appreciation that you could otherwise have gained. Therefore, the use of stop loss order may not be so helpful for long-term buy-and-hold traders. When a stock price falls, the stop loss order is going to lock in loss instead of giving you a chance to determine whether a seemingly slight price decline is probably signaling a buying opportunity. It can happen that a stock price falls and all of a sudden, it appreciates to higher levels. You will have missed the opportunity to cap in big profits if the stock position is closed and the price suddenly rises to greater highs. Traditionally, stop loss orders are considered tools for preventing losses hence the namesake. However, besides this, they can also be used to lock in profits. In this case, they are regarded as trailing stops. In such a case, the stop loss order applies on a percentage level below rather than the price you bought the stock. The price of a stop loss will adjust as the price of the stock fluctuates. Using a trailing stop order allows profits on a particular stock to run while also guaranteeing that at least you will have some realized capital gain. A stop loss order is an important tool, which many investors do not take advantage of in their trades. However, while this tool has the potential of preventing losses and locking in profits in times of stock price fluctuations, on the other hand, it is critical to realize that these stop loss orders do not always guarantee that you are going to make profits in the stock market. You will still need to make smart stock trading decisions. Otherwise, if you fail to do so, you are as much likely to lose money as you would do if you traded without a stop loss, only this time, it occurs at a slower rate.